Eighteen boxes empty now, and thirteen to go. A couple of days ago, we had only the brackets up for our shelves – we still had yet to fit the actual shelves onto the brackets. You can see the brackets on the wall to the back, with one shelf up. The boxes lined up in front of the bracket wall are all filled with books. Yesterday we fitted the shelves and started to decant all our books onto them. Today I finished unpacking my tchotchkes and filled the empty spots on the shelves. Feels so much more like home already! We plan on putting the dining table at that end of the room. Opposite the shelves is our living area, and the balcony with views of the sea. Today was a beautiful day, a very comfy 26 degrees or so and a pretty clear day too – not as clear as when I was here in July/August, but pretty good nonetheless given the past few murky days. Normally there are a couple container ships in the channel, but today was full of activity. Little speed boats zipping along, a large container, and some kind of ship with crane in the foreground. You can see Lantau Island (where the airport is) in the distance (click to embiggen). Watching Deuce and Strawberry interact this past week has been interesting. The norm between the two has been as follows – Strawberry approaches Deuce, wagging her tail, making growly noises, lowering her head and extending her paw as if to say hi. Deuce responds by staying stock still and watching her warily. She’ll then slowly come closer, sniffing, wagging her tail, backing up, and the coming forward again. As soon as she gets within touching distance however, Deuce makes a run for it. But today was different. She was sitting in Deuce’s donut, and DH placed Deuce in next to her. Before today, he would simply jump out and run off. But today, for some reason, he stayed. He looks rather unimpressed in the photo, but kudos to him for not running off. She even got to gnaw on his leg a little, and though Deuce leaned away, he didn’t actually leave. Is it because Deuce finally has warmed to the little one? Or, far more likely, I think he has figured out that she means extra snacks for him. He has taken to jumping into her play area and scoffing up whatever food she’s left in her bowl. Rather naughty of him, but given his piggy ways, totally unsurprising! Our boxes and furniture were delivered on Thursday so finally the flat is feeling a little more ‘homely’. The moving guys arrived and unloaded a couple boxes. Then they unloaded a few more. Then a few more. Pretty soon our entire lounge and kitchen were filled with them. 95 boxes in total! The movers were really quick and put together our shelves and bed so we’re left with sorting out the books and linens. Friday I had an appointment with my OBY where we did all my bloods which will be the third time I’ve had blood taken for prenatal tests. I had them done twice in London. First time in preparation for taking my results to HK, but despite waiting at the surgery for the nurse for over 3 hours, and having vials of blood extracted, apparently only midwives are allowed to take the blood that is processed for prenatal tests. So then when I had a midwife appointment, they took the blood for prenatal stuff again. I was also given a glucose test in London, and then again on Friday here which was one of those tests where I had blood taken three times over three hours. I felt like I was donating blood to a vampire blood bank – they took about 12 vials of blood in total. Boy was I happy to leave the hospital. Strawberry is still delighting me and causing Deuce a bit of consternation. Deuce occasionally will sit with his back to her, and she’ll nibble on him until he gets annoyed and leaves his comfy spot. They make a little progress every day. When I brought her home on a week ago she weighed 800 grams. She put on 30 grams at the vets on Sunday night. When we weighed her again on Thursday when I took her back for a check up, she was 1000 grams. Was so pleased. Yesterday however, she started to have tummy troubles again, and despite weighing 1100 grams on Friday morning, this morning she was down a little to 1060 grams. I’m hoping it’s just from stress (from washing her paws… she really doesn’t enjoy it) or antibiotics (she’s on those twice a day) as she’s eating well, is bright and playful and when she is awake totters around quite happily. Will see what the vet says later today. I’ve put up a little ticker on the sidebar to track the donations going to Hong Kong Dog Rescue. So far we’ve raised HK$1280 for Hong Kong Dog Rescue in a week. Thanks so much to everyone. I am sure if she could transcend the time/space continuum, little Strawberry would totter over and nibble your ear in thanks. My goal is £500 which gives long term care for two doggies, or neuters a dozen dogs, or feeds a dog for almost 3 years. You can donate as little as HK$80 (about £6.50 or US$11) which licenses a dog and gives a rabies vaccination too (all dogs in HK must be licensed. Just like mountain bikes!!). Every little counts. So thank you watching out for and taking care of Strawberry and other rescue dogs like her. If you do donate, let me know the amount as I keep a tally on my blog. And when we hit £500 I’ll do a draw of all the people who donated and one lucky person will get a pair of custom fit socks handknit by yours truly. More details here. And lest we forget the season – Hallowe’en is upon us! Even here at our apartment complex they’ve gotten into the spirit and have put out a huge jack-o-lantern complete with scary spiders! Haha but just in case we forgot where we were – see the yellow sign? Here’s the close up. Yup – another Do Not. Made me want to deliberately place my hand on the hallowed pumpkin JUST BECAUSE. Juvenile, moi? It’s been a week now since landing in HK. A pretty soft landing – I’ve been doing some Knit Love Club work (Methuselah mystery sock, the next bonus pattern and the last sock design for 2011), and between times basically pottered around the house, explored around the area at a rather leisurely place, and done a fair bit of baking. I finally found where to buy padded envelopes (at the post office! but you have to ask), so I can send Lisa her Carol Feller book from the draw. I still need to find where to buy a wrench. I’ve also realised that despite all the ‘DO NOT’ signs, people here just blithely ignore them all. Today I went for coffee at the local Starbucks with my upstairs neighbour M. We sat out in a nicely landscaped podium that had about 4 large signs saying ‘No Pets’. Deuce was with me (I didn’t know about the no pets thing) – but not one person blinked an eye or said anything about me having my dog there. The barista at Starbucks was all excited to see him, and the security guy outside really didn’t seem to care. Maybe that is why there are so many Do Nots – because everyone ignores them, making the powers that be churn out even more signs. The more signs the easier it is to ignore them, the more people ignore them the more signs there are…. Sunday’s excursion to Horizon Plaza was fascinating. The place looks like it used to be an office block with a central column of stairs and elevators. All the units are positioned around the central column. There were something like 28 floors, and we basically went to the top and walked down to the shops we wanted to see. There were some beautiful antique Chinese piece, repros (like Arne Jacobson & Verner Panton chairs) some better quality than others, modern Italian style furniture (a la Poliform), eco wood furniture, and some smaller designer furniture shops. Plus loads of outlets (Replay and some designers). Tiring though – and by the end I really couldn’t care less if I never saw a furniture shop again. But time is of the essence – we need to order a bed for our room as we’ve got a rental at the moment and almost everything takes 6 weeks to deliver. And lights. We need lights. It’s a bit depressing having only two rooms that are not bathrooms with any kind of lighting. The weather has been varying between hot and sunny to hot and muggy. This morning wasn’t too hot but was incredibly humid. I think a rain storm is coming up. I am kind of excited to see a spectacular rain storm – partly because they are impressive and also because it will wash away the eau de piss smell around the entrance to our apartment complex. The wee one seems to be getting back her stride – she’s eating like a trooper and starting to play and horse around. When she wakes up, she rolls around on her back with her front paws in the air by her face waving them around like she’s saying hello! Her belly is round, warm and pudgy. Despite her paws looking horrific (you can see the worse off right one in the photo above) I think they are actually healing. The bad stuff is coming away. Hopefully so long as she continues to be perky and happy that will also contribute to her healing. Deuce has even deigned to come within sniffing distance of the wee one (better than yesterday when he kept a full foot and half away from her always). She managed to totter over to his side while he was distracted by her food bowl, and sniffed him before he managed to back away. Go Strawberry! I think she’ll break Deuce down sooner or later. Moving on…. I made cupcakes last night (belated for DH’s bday). I was super impressed with the chocolate cake recipe I used – resulting in very chocolatey, moist and light cupcakes. Will definitely use it again. I used a buttercream frosting which was lovely – from another Alice. Very pleased with the results, though my frosting skills are woefully lacking. My first go to point for tried and tested recipes is Molly Wizenberg’s blog. The raised waffle recipe I love and always use in our waffle iron (which is coming on Thursday!!! SO EXCITED!) is also from her blog oops! I did try the Marion Cunningham one and didn’t like it – the one we always use is the yeasted one from Kate Habershon’s Pancakes and Waffles recipe book. Helen requested the recipe for the buttermilk biscuits and it won’t be a surprise that this is also from Molly Wizenberg’s blog. I adapted her cream biscuit recipe as I didn’t have enough cream and subbed half buttermilk instead. It had a nice subtle tang, though they didn’t rise quite as much as I’d hoped. Having said that, they were also a bit wetter than the recipe called for (I used a bit too much liquid). They still turned out quite yummy though so I agree with Molly Wizenberg that these are really foul proof biscuits! The biscuit recipe (like a very fluffy and moist scone) and the waffle recipe both originate from Marion Cunningham’s “The Breakfast Book”; I must get myself a copy. Looking forward to our furniture arriving on Thursday. Will get some track lighting for the living room, which means I’ll be able to enjoy my favourite working spot – sitting on the sofa, listening to music or an audio book, or watching TV (if the pattern isn’t too complex) and knitting! I’ll even have a view and not one but two little pups snuggling up next to me. Maybe a cupcake and a cup of tea. Heaven. After the vet saw Strawberry yesterday, he decided to keep her overnight to make sure she was eating – he was worried about her diarrhea and that she hadn’t put on any weight in a week, plus all her other maladies (paws, tail, nail bed, etc). Needless to say I spent all Sunday and through the night worrying about her and hoping she was going to come out on top. When I was picking her up the Hong Kong Dog Rescue (HKDR) van pulled up outside the vets and out came 5 dogs that had been rescued from the government pound. You can tell these aren’t wild dogs living in the bush – alot are from pet shops or breeders. There was a shih tzu and an 8 year old pug among the group. 4) the dog is old and/or sick. I can understand perhaps leaving a pet behind with family or with a good home if where you were moving to was not a good environment for a pet (ie living in the bush with gorillas). But outright abandonment to almost certain death? I just can’t wrap my head around it. Thank goodness for HKDR and other rescue organisations for doing what they do. I asked the vet what Strawberry’s treatment has cost thus far – with two stays at the vet hospital, special food, antibiotics, worming medicine, etc – and was told that the last week’s vet bills have totted up to $HK1265 (approx £100). Since HKDR started in 2002, it has rescued, rehabilitated and rehomed over 5,000 abandoned dogs. Every one is neutered or spayed, vaccinated & microchipped. It’s a huge undertaking and a big cost. And of course, HKDR being a charity is run entirely on donations. To help HKDR continue to do the great things it does, it would make my heart swell with joy if my dear readers – knitters, family & friends – could join forces and raise some money for HKDR. The donations page for HKDR is here. There are a lot of affordable levels of donations – ranging from HK$80 (about £6) under “Dog Care” for Rabies Vaccination and Licence, and up to regular monthly donations (all through Paypal). If you do donate, email me AliceATsocktopus.co.uk (replacing AT with @) with the amount, and I’ll keep a running tally on the sidebar. My goal is to raise £500 for HKDR. As a little enticement, I have 10 copies of my book Socktopus to give away. Every 2 weeks (or more often if there are lots of people donating!) I will do a draw from all the people who have donated (and emailed me) and send out a signed copy of my book to the winner. When we hit the goal of £500, I will do a draw from ALL the names. The prize is a pair of hand knit socks – knit by me, just for the fabulous footsies of the winning name. DH spent Friday and Saturday in Beijing at a work conference. My first weekend in Hong Kong was quiet, and yet eventful. Saturday morning, I was lying in bed with my laptop and Deuce snoozing beside me. I’ve been following Hong Kong Dog Rescue on Facebook for a while – since we are considering adding another furry kid to our household and wanted to get a rescue since it’s such a problem in Hong Kong. There was an appeal on their facebook page to foster Strawberry, a 3 week old puppy who had been staying with the HKDR founder Sally. The appeal from Sally: "Can anyone please foster little Strawberry? Her siblings are so much bigger that they squash her, and now somehow her front paws got injured while I was out. She needs more care then I have time for, and she likes to be fed with a spoon and be cuddled." I found myself answering the call and offering to foster – after all being new here in Hong Kong meant I had the time and space to spare. So come 3pm on Saturday, I was at the HKDR Ap Lei Chau Homing Centre picking up this little bundle of black. She had a bout of diarrhea last week which saw her at the vet for a few days. It’s very dangerous for puppies since they are so small – they go downhill really quickly. The vet thought she wouldn’t make it – but she pulled through. Then her front paws got chewed on – which precipitated the urgent call for a foster. Her paws are getting better – but they are damaged, probably beyond repair. I had to take her back to the vet when I got her home from HKDR – a good look at her paws and I knew we had to go see the vet. They were covered in dried puss/gunk, and it looked like the top of the last two digits were severed from the main paw. She’s a real trooper – she only cried when the vet was cleaning all the puss and crap off her paws, otherwise she is very stoic. After the washing, it became apparent that she’s lost a claw off her left paw and it looks like she’ll lose three off her right. All the fur is gone from the top of the clawless digit on her left paw, and we’re just waiting for the dead bits to fall off her right paw, which will expose hairless digits again. Poor little thing – she’s been through the wars, this one. I forget how much puppies sleep – she’s awake for 40 minutes then sleeps a good 4 hours. Deuce isn’t so sure of her – took one sniff and left the room. I think he needs time to adjust a little and get used to the little usurper. DH pretends to ignore the pup, but then comes out with comments that reveal that he really is getting involved – things like ‘help her to her bowl – she’s hungry’, or ‘make sure you put the ointment on her paws so they don’t get infected’ etc. He did exactly the same with Deuce when we first got him. Unfortunately I have to take her back the vet today – she’s had some diarrhea again, despite eating well. She needs her energy to heal. There is also the possibility she may have distemper… which would be really bad. She’s too young to vaccinate. I really hope she’s going to battle this one like a little warrior princess and come out on top. Wish us luck. As it’s DH’s bday today, I’m going to make some cupcakes for him later on after some furniture shopping at Horizon Plaza. We have dinner plans tonight at Cafe de Paris which should be a trip. From the photos it looks just like a Parisian cafe. But of course in Hong Kong. It’s nice to have him back and to spend some time with him. Warm cookies and cold milk are a comforting duo. Since I had a bunch of baking stuff, I decided to make some buttermilk biscuits for DH in the morning as he is off to Beijing today for a meeting with his Beijing office colleagues. Stinky boy isn’t back til late on Saturday. When you look to the right you can see our neighbouring towers in phase 6 and the pools on the podium level below. To the left are other towers of phase 4 that are a little uglier, but which themselves have unobstructed views of the islands and the sea. The podium is a very relaxing landscaped area with quite a labyrinth of walkways, nooks and crannies to sit and watch the world go buy. There are loads of playgrounds and a grassed area (but of course with signs saying no walking, no cycling, no ball games, etc etc). I am learning that, despite, or perhaps because of, the relative laissez-faire attitude HK has towards the economy, it has a bewildering array of seemingly draconian rules, or rather, do nots. This is one of many signs in the Cyberport Waterfront park. Yes that does say no kite flying. And no leaning on the fence. Because… well, if anyone were to fly a kite or lean on a fence I am sure anarchy would ensue. So the park is virtually empty of community activity which is a shame. Mostly moms pushing prams, domestic helpers walking dogs, and expats jogging. I have yet to see a kid in there playing. Some things are eye wateringly expensive. On principle I try to avoid battery chickens – which are ubiquitous here in HK (H5N1, anyone?) – so when I was hankering after a roast chicken imagine my horror when I saw the cost of the free range, antibiotic free, organic chicken at the local supermarket. That sucker cost an astounding HK$249. That’s about £20 or USD35. Ouch. I guess we aren’t going to be eating chicken all that much. And when we do… we are going to make it last and last and last. Today Deuce & I went off to Horizon Plaza which is home to a gazillion (literally) furniture shops, and one large pet store called Whiskers n Paws. Deuce had a good time sniffing around all the aisles (especially the food and treat aisles), and I got him all sorts of goodies – new bowls, treats, a new dog tag with my HK number on it, and some cool new food called The Honest Kitchen. I’m really excited about this stuff – it’s human grade, dehydrated food from sustainable, often organic sources. They don’t source anything from China (seriously, who would with their safety record for pet food, not to mention food meant for human consumption). The pet shop also has a “Bark Park” which is an outdoor playground for their four legged customers. There weren’t any other barkers out there when I went with Deuce but we met a lady with two pugs heading over from San Fransisco – maybe we’ll see them there sometime. I found an Italian deli – selling tinned plum tomatoes from Italy at a fraction of the cost from the supermarkets. And lots of great olive oil and balsamic vinegar. I’ve been hankering after a really good pasta dish with a rich tomato sauce…. I also got to stop in at Sift, a great cupcake place on the 22nd floor. They had a branch around the corner from DH’s first serviced apartment, but we never made it there. I got a salted caramel cupcake that was really lovely – moist chocolate cake and a lovely salted caramel icing. While I’m still missing my friends from home, I’m slowly finding my way day by day, helped along by the occasional cupcake and cookie. First off, winner of Carol Feller’s new book. Thank you to everyone who commented. The winner of the book is – Lisa from the UK! I’ve emailed you for your address, but if you haven’t received it please can you email me your address using the Contact tab above. Thanks! 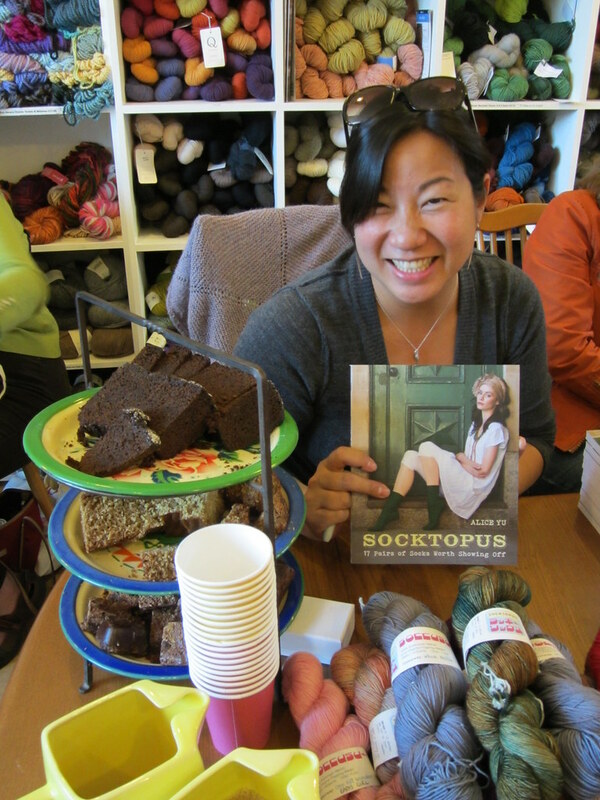 On Saturday before I left for HK Loop in London hosted a book launch and signing for my new book “Socktopus”. So much fun! Cake from Bittersweet Baker and knitters from all over – Sweden, Norfolk, Chicago, and London to name a few. Very exciting. Photo shamelessly slurped from Josiekitten! The launch party was so much fun – and was followed by a last hurrah pub dinner with some of my favourite knitting peeps. A really lovely way to spend my last evening in London. Big hugs! First day in Hong Kong has been pretty uneventful – took Deuce for a walk in the local landscaped park thingie – met some dogs with their carers – a mix of domestic helpers and owners. Lovely people. I’ll be bumping into them regularly I imagine. Took Deuce to a vet whose method of feeding pills I really didn’t like – he tried to shove a pill down Deuce’s throat by forcing his mouth open and pushing the pill as far back in his throat as possible. If he’d bothered to ask me before doing that I could have told him to give me the pill to take home (a little coating of cheese does wonders….). I was kind of proud of Deuce for spitting the pill up whole. A bit freaky here is the danger of tick fever – apparently ticks are a big problem. Deuce was given a tick collar which absolutely stinks – on top of his regular Frontline drops. I’ve decided against the collar since I find the smell really offensive. I think I’ll have to bite the bullet and do a daily check instead and tweeze any buggers off. Bleck.